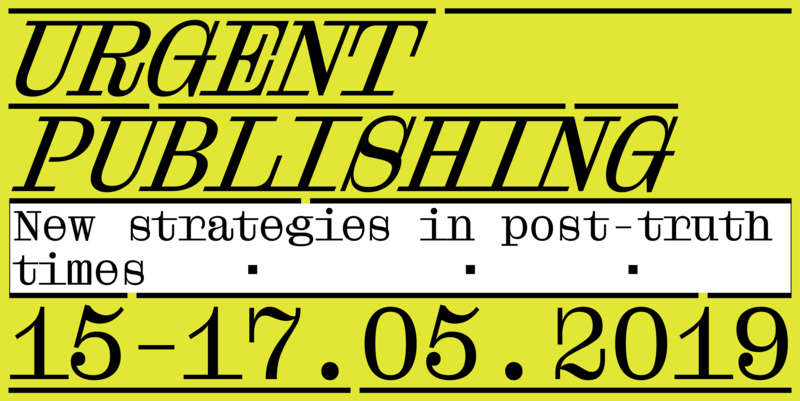 Institute of Network Cultures, ArtEZ University of the Arts and Willem de Kooning Academy are happy to invite you to Urgent Publishing, a conference with presentations and workshops about publishing strategies in post-truth times. 15, 16 and 17 May 2019 in Amsterdam and Arnhem. Admission is free but registration is required. There are limited seats available. With this registration you book a ticket for the conference and sign up for a workshop. Please let us know if you will also join us for the presentations and dinner at Motel Spatie. On Thursday three sessions will each focus on different strategies for the post-truth era that were explored on the night before: new forms of collaborative publishing, new forms of distribution, new ownership. The sessions and the project presentations will inform Friday's workshops. On Friday there are three practical, hands-on workshops you can choose from, which will each focus on one of the strategies presented in the panels from the day before. A plenary session will be held at the end to recap the strategies and outcomes from the workshops. At 18:00 we will join #synchronicityofparasites for the evening program and dinner at artspace Motel Spatie. Workshop 1: Say It Ain't So by Amy Pickles and Cristina Cochior. Workshop 2: All Sources Are Broken: a Post-Digital Reading Group by Labor Neunzehn. Workshop 3: Surgencies: A Personal Protest Statement by NXS World.